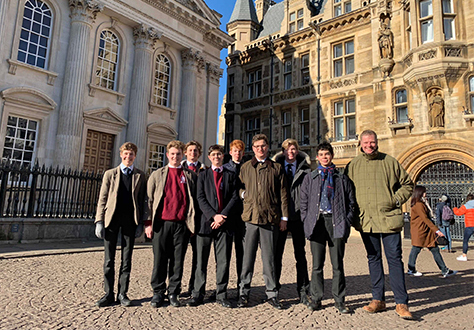 The Charterhouse CCF shooting team had an extremely successful trip to Cambridge University for an away match, returning with an impressive winning score of 1491 to 1436. In girls’ football, the squad savoured a fine 8-0 win over Bradfield in the ISFA Cup, along with a 4-0 away win at Westminster. Our congratulations go to Charlie Goutkin-Smith who has been selected to represent the ISFA U14 National Football Squad to play Burton Albion FC on Sunday 17 February. In boys' hockey, the 1st XI has progressed to the third round of the England Hockey National Cup having beaten Churcher's College 6-0. The squad has also enjoyed wins over Eton and Bradfield in the past fortnight. Netball have been recent winners at Seaford College as the coaching and support from Surrey Storm continues to pay dividends. The U16s squash team was the closest it has come to National Finals since 2014, in a fine performance in the regional finals. To beat Truro School 3-2 and Whitgift School 4-1 was superb, even greater perhaps our 2-3 loss to a very strong Wilson's squad. In the same competition, the U14s came third, with a good win over Felsted. In fives there have been wins over Westminster, Highgate and Berkhamstead. The basketball squad continues its fine form with wins over RGS, Guildford and Hurtwood House.